I’ll be honest: I didn’t love these and didn’t at first think them blog-worthy. When I mentioned to our guests that I wasn’t thrilled with these and apologized,* though, they all told me I was wrong and that they were delicious. Well, sure, duh, of course they would because our friends were not raised by wolves. I wasn’t fooled. But then they all went back for seconds, then thirds and then the next thing I knew the plate was empty. Now, the LBUH and our friends are polite, but they’re not that polite. The LBUH in particular is certainly not clear-the-plate polite if he’s not loving something, he’s more of the thank-you-for-your- efforts-and-scrape-the-plate-into-the-dog’s-dish-while-you’re-not-looking kind of polite. So I let the empty plate convince me: these may not be to my own taste**, but they’re a crowd-pleaser. Indeed, one of our friends even whipped out his fancy professional camera and took some pictures of his own in an effort to convince me to post about these. How could I let his pics*** go to waste? Preheat oven to 350 degrees, and lightly grease an 8 inch square baking dish. Cream the butter with ¼ cup of sugar, and stir in ½ cup of the all purpose flour and the whole wheat pastry flour. Press the mixture into the prepared dish and bake for 15 minutes. (It won’t look cooked at this point, but that’s OK! Its going back into the oven a little later.) Allow partially baked crust to cool slightly as you prepare the filling. Beat together the eggs, lemon juice and zest, baking soda, remaining granulated sugar and 2 tbsps of all purpose flour. Pour filling mixture over the prepared crust. Return to over, and bake for approx. 20 more minutes. (The squares should be firm at the edges, but still soft in the middle.) Cool, then sift confectioner’s sugar over the top, to taste. Cut into squares and serve! If, unlike me, you end up with leftovers, store these in the fridge. * As I seem to recall Amanda Hesser noting in Cooking for Mr Latte, doing so isn’t terribly polite, as it interferes with your guests’ enjoyment of their meal. Also, its generally akin to fishing for compliments. I give myself a pass on this one, however, as we’d gathered friends expressly for the purpose of vetting recipes for the blog. Thus, our friends came prepared to be asked for and to express frank opinions, as well as braced for experimentation. ** My beef with these was that I like lemon squares that are more little squared off pieces of lemon tart than like a lemony bar cookie. 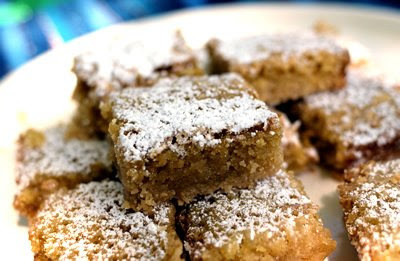 This recipe creates more of a bar cookie square. If that sounds delish to you, than you’ll like these. In the meantime, and with all due respect to the generally infallible Mr. Bittman who put these in the bar cookie section of his very handy tome, I’m still on the hunt for the perfect tart-like lemon square recipe. I’ll let you know once I’ve found it! *** All together now: OOoooooOOOOOoooo! Pretty! LOVE this recipe~ can't wait to make it! It has a shortbread base, which I love. I'd still love to find one with even more lemon topping, but this is a good start. I love lemon squares! These looks great! I love this blog! 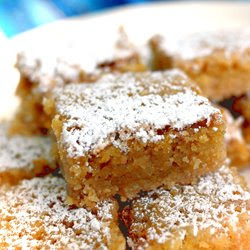 My roommate has a family recipe for the type of bars I think you are looking for, crisp crust and soft gellike filling with lots of powedered sugar, one of her secrets is using Meyer lemons they are amazing! For some reason my computer keeps crashing the internet whenever I try to leave your site, maybe it is just IE? Great post an ingredient near and dear to my heart. I adore lemon and often it is hard to find a recipe that really brings out that flavor. Have bookmarked this recipe for future reference. what a great recipe! 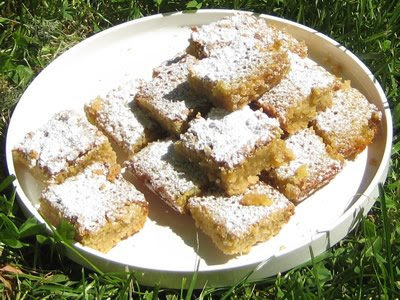 My mother is a huge fan of lemon bars, I have to make these for her because I know she would love these bars just as much as me. My familky adores lemon quares. The fact that they "went away" is testament to their goodness and they look delicious. I so agree with your assessment of the recipe. I'm a lemon girl myself, and really want them tart and lemony. *But* I applaud you in your post and description! I really like the way you described the results and the reviews. So often in cooking I find myself expecting some outcome and being disappointed in the results. Even if the result was also excellent, just not what I'd imagined. I saw your lemon bars on foodgawker and the brown color of it intrigued me. I think it's interesting that you added whole wheat pastry flour. Cool! I'm with you on lemon tart-type lemon bars. I have a great lower fat recipe from Alice Medrich that uses cornmeal in the cookie crust. Nice pics and always fun to share with friends! Wow .... Lovely recipe . Looks yummy . I also think it's great to blog about things that didn't turn out quite as you expected. Keeps everything real. :) That said, it's nice when a recipe you don't love turns out to appeal to the masses anyhow! We've changed our methodology a bit. We do consider all purpose flour to be a staple, but it doesn't seem right to not "count" it when we're using a good bit of it in a recipe.. If this recipe had called only for a tbsp of AP flour, we would have just marked it "staple"; similarly, if the recipe had called for 4 cups of confectioner's sugar, we would have included that in the cost analysis. Make sense? I love lemon bars but never made any. They look delish so I'm gonna make these. Thanks!! I'm not really a lemon person but these definitely look delicious. I'm glad you posted it because there are a lot of good foods out there that may be particularly your (or my) kind of taste. The plate speaks for itself. Nice recipe. Will surely try. Can the whole wheat pastry flour be replaced with normal whole wheat flour as we do not get the pastry flour here. I've never had a lemon square - I know, it's hard to believe, but I will definitely give these a whirl! Monique has a similar lemon tart squares recipe handed down from the family a couple generations and she makes them better than me every time! They look just like those in your recipe. Lemon squares are one of my all time favourite desserts! I could eat a whole tray in one sitting! Found your blog through FoodBuzz - love it! 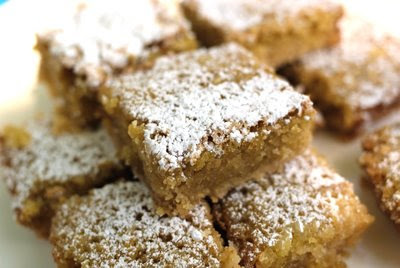 Lemon Bars are a favorite of mine, and I've found that this recipeproduces a lemony, tart-like bar. Great post - love your blog!